Does God ever give us more than what we know that we need? Is God extravagant? One day when my wife and I were traveling in the Northeastern region of Florida, we needed to stop to take a break. 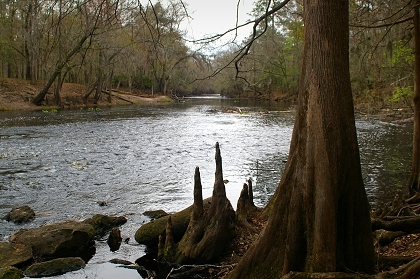 We quickly looked at the map and found O' Leno State Park just a few miles off the highway. We knew nothing about the park, but decided to take a look. We found a place to get some sandwiches and headed to the park. It went far beyond our need to take a break. It is one of the most highly rated parks in the state. Wow! We never expected that. It was a peaceful and cloudy day. We ate our sandwiches and hiked around the scenic area and returned to our car just before a heavy thunderstorm came. We were blessed beyond our need! Praise the Lord! Some people feel that possessions are evil and therefore God would not have those who are spiritual to have possessions. These people live in poverty in more than one way. Jesus ran into a similar concept with the disciples when a woman having an alabaster box of very precious ointment, and poured it on his head, as he sat down to eat. "But when his disciples saw it, they had indignation, saying, To what purpose is this waste? For this ointment might have been sold for much, and given to the poor" (Matthew 26:8-9). Jesus responded, "For ye have the poor always with you; but me ye have not always" (Matthew 26:11). Some people quote Philippians 4:19, "But my God shall supply all your need according to his riches in glory by Christ Jesus", THEN try to limit what "need" means. Some today advocate the question, "What kind a car would Jesus drive?" They would say, "He would certainly not drive an expensive car, because he would give all his money to the poor or to evangelize the world." A simple answer is that Jesus would drive whatever the Father provided and directed for him to drive. What about the riches of Abraham? "And I will make of thee a great nation, and I will bless thee, and make thy name great; and thou shalt be a blessing" (Genesis 12:2). "And Abram was very rich in cattle, in silver, and in gold" (Genesis 13:2). Why did God bless him with wealth? He could have just said, "Be content with what you have." Did he really "need" all the cattle, silver, and gold? What about Solomon? He only asked for wisdom and God gave him a great abundance of fame and wealth. It was extravagance beyond our imagination. "And I have also given thee that which thou hast not asked, both riches, and honour: so that there shall not be any among the kings like unto thee all thy days" (I Kings 3:13). "So king Solomon exceeded all the kings of the earth for riches and for wisdom. And all the earth sought to Solomon, to hear his wisdom, which God had put in his heart. And they brought every man his present, vessels of silver, and vessels of gold, and garments, and armour, and spices, horses, and mules, a rate year by year. And Solomon gathered together chariots and horsemen: and he had a thousand and four hundred chariots, and twelve thousand horsemen, whom he bestowed in the cities for chariots, and with the king at Jerusalem. And the king made silver to be in Jerusalem as stones, and cedars made he to be as the sycomore trees that are in the vale, for abundance" (I Kings 10:23-27). So did Solomon really need all that? What kind of car would he drive if he was living today? Others react to the prayer of Jabez and say that he was selfish. If so, why did God grant what he requested? For more information see: Jabez's Prayer. Please understand that I am not advocating the worship of riches. Jesus said, "Lay not up for yourselves treasures upon earth, where moth and rust doth corrupt, and where thieves break through and steal: But lay up for yourselves treasures in heaven, where neither moth nor rust doth corrupt, and where thieves do not break through nor steal: For where your treasure is, there will your heart be also" (Matthew 6:19-21). I am not even promoting in this article the true Biblical principle of sowing that you may reap abundantly. However, I am trying to encourage you, the reader, to stretch your faith toward God. What about Jehoshaphat? God gave him so much spoil that it took three whole days to gather it up and take it back home. "And when Jehoshaphat and his people came to take away the spoil of them, they found among them in abundance both riches with the dead bodies, and precious jewels, which they stripped off for themselves, more than they could carry away: and they were three days in gathering of the spoil, it was so much" (II Chronicles 20:25). Did he really need all that spoil or did God just bless him richly in his faith? What about Job? Did God only give him that which he needed? "And there were born unto him seven sons and three daughters. His substance also was seven thousand sheep, and three thousand camels, and five hundred yoke of oxen, and five hundred she asses, and a very great household; so that this man was the greatest of all the men of the east" (Job 1:2-3). If possession were evil, why did God give him twice as much in the end? "And the LORD turned the captivity of Job, when he prayed for his friends: also the LORD gave Job twice as much as he had before. ... So the LORD blessed the latter end of Job more than his beginning: for he had fourteen thousand sheep, and six thousand camels, and a thousand yoke of oxen, and a thousand she asses. He had also seven sons and three daughters " (Job 42:10, 12-13). I have read the feeding of the five thousand, plus women and children with the five loaves and two fish and looked at it almost rejecting the account because they took up twelve baskets full of fragments after everyone had eaten and was filled. "And they did all eat, and were filled: and they took up of the fragments that remained twelve baskets full. And they that had eaten were about five thousand men, beside women and children" (Matthew 14:20-21). It seemed to be a waste. Did God miscalculate in the amount of the food to be multiplied? What did they do with the twelve baskets full? It was certainly more than what they needed. The same is true a little later when Jesus fed the four thousand, plus women and children with seven loaves and a few fish. They took up seven baskets full after everyone had eaten and was filled. "And they did all eat, and were filled: and they took up of the broken meat that was left seven baskets full. And they that did eat were four thousand men, beside women and children. And he sent away the multitude, and took ship, and came into the coasts of Magdala" (Matthew 15:37-39). In both cases, it seemed much in an excess of what was needed, maybe even wasteful. However, the accounts are real! The Bible doesn't even record what the disciples did with the nineteen baskets full which were left over. What they did with the leftovers was not the point of the account. 1. I believe that God would have us see Him as the RESOURCE for all blessings, be they financial or otherwise. "And Abraham called the name of that place Jehovahjireh: as it is said to this day, In the mount of the LORD it shall be seen" (Genesis 22:14). The term "Jehovahjireh" means "Yahweh is the provider" or "I AM is provider". "Every good gift and every perfect gift is from above, and cometh down from the Father of lights, with whom is no variableness, neither shadow of turning" (James 1:17). "The blessing of the LORD, it maketh rich, and he addeth no sorrow with it" (Proverbs 10:22). 2. I believe that God wants to show himself as being GRACIOUS and GENEROUS. "Fear not, little flock; for it is your Father's good pleasure to give you the kingdom" (Luke 12:32). It gives God pleasure to bless us. 3. I believe that God wants us to CALL upon Him in faith for the blessings. "Call unto me, and I will answer thee, and shew thee great and mighty things, which thou knowest not" (Jeremiah 33:3). "Hitherto have ye asked nothing in my name: ask, and ye shall receive, that your joy may be full" (John 16:24). 4. I believe that God wants to BLESS us so that we can bless others. "Give, and it shall be given unto you; good measure, pressed down, and shaken together, and running over, shall men give into your bosom. For with the same measure that ye mete withal it shall be measured to you again" (Luke 6:38). In order to give, one must first have something to give. "Blessed be God, even the Father of our Lord Jesus Christ, the Father of mercies, and the God of all comfort; Who comforteth us in all our tribulation, that we may be able to comfort them which are in any trouble, by the comfort wherewith we ourselves are comforted of God" (II Corinthians 1:3-4). 5. I believe that God wants to BLESS us so that we can bless Him in worship. "And the LORD gave the people favour in the sight of the Egyptians, so that they lent unto them such things as they required. And they spoiled the Egyptians" (Exodus 12:36). "And they received of Moses all the offering, which the children of Israel had brought for the work of the service of the sanctuary, to make it withal. And they brought yet unto him free offerings every morning" (Exodus 36:3). "And Moses gave commandment, and they caused it to be proclaimed throughout the camp, saying, Let neither man nor woman make any more work for the offering of the sanctuary. So the people were restrained from bringing. For the stuff they had was sufficient for all the work to make it, and too much" (Exodus 36:6-7). 6. I believe that God wants to BLESS us so that others can see how good God is to us. "Bring ye all the tithes into the storehouse, that there may be meat in mine house, and prove me now herewith, saith the LORD of hosts, if I will not open you the windows of heaven, and pour you out a blessing, that there shall not be room enough to receive it. And I will rebuke the devourer for your sakes, and he shall not destroy the fruits of your ground; neither shall your vine cast her fruit before the time in the field, saith the LORD of hosts. And all nations shall call you blessed: for ye shall be a delightsome land, saith the LORD of hosts" (Malachi 3:10-12). 7. I believe that God wants to BLESS us as a reward for our repentance. When Nebuchadnezzar, the king of Babylon, repented after being as a wild beast in the field for seven years, God blessed him with more that he had before. "The same hour was the thing fulfilled upon Nebuchadnezzar: and he was driven from men, and did eat grass as oxen, and his body was wet with the dew of heaven, till his hairs were grown like eagles' feathers, and his nails like birds' claws. And at the end of the days I Nebuchadnezzar lifted up mine eyes unto heaven, and mine understanding returned unto me, and I blessed the most High, and I praised and honoured him that liveth for ever, whose dominion is an everlasting dominion, and his kingdom is from generation to generation: And all the inhabitants of the earth are reputed as nothing: and he doeth according to his will in the army of heaven, and among the inhabitants of the earth: and none can stay his hand, or say unto him, What doest thou? At the same time my reason returned unto me; and for the glory of my kingdom, mine honour and brightness returned unto me; and my counsellors and my lords sought unto me; and I was established in my kingdom, and excellent majesty was added unto me. Now I Nebuchadnezzar praise and extol and honour the King of heaven, all whose works are truth, and his ways judgment: and those that walk in pride he is able to abase" (Daniel 4:33-37). 1. I believe that God has given me the opportunity and the grace to have this website that you, the reader, may be blessed. 2. I believe that God gave me my office that I would have a place to counsel and bless others. 3. I believe that God has provided income for my wife and I outside of counseling so that I don't have to charge high fees for counseling. Check the boxes where you desire to receive God's blessings beyond your need. If you will prayerfully look, you probably will find some area in your life where God has already blessed you beyond your need.